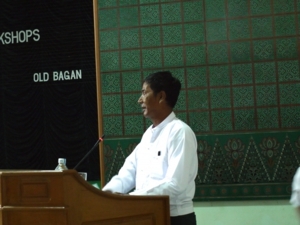 2014 is the 60th Anniversary of the Establishment of Diplomatic Relations between Myanmar and Japan. The Japanese Foreign Ministry and the Japanese Embassy in Myanmar has recognized our program and authorized the "Japan-Myanmar Lacquer Craft Exchange Research Program" to be an official part of the celebrations. 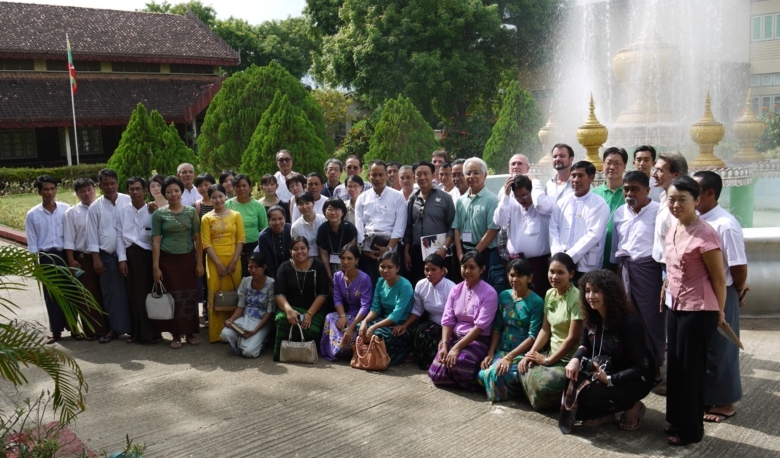 We held an exhibition of international and Myanmar lacquer art at the Lacquerware Technology College in Bagan from 10-13 September concurrent with its yearly workshop and lecture program. 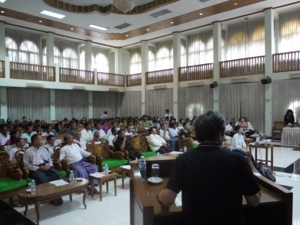 Over 40 artworks were exhibited. 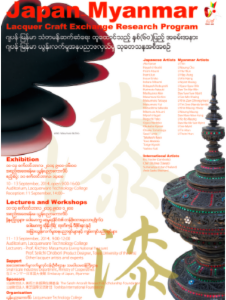 Organizers：Lacquerware Technology College, Asian Lacquer Craft Exchange Research Project. The technologies that produce lacquer crafts and ware emerged slowly over millennia and are, thus, wedded to and rooted in the spiritual traditions and heritage of society. 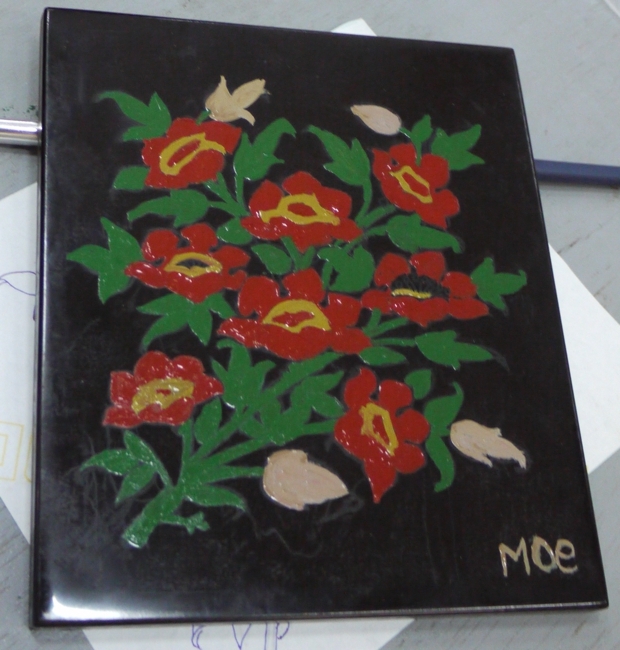 Scrupulous attention to material and method is what creates the shining awe-inspiring beauty of lacquerware. In a sense, lacquer is a nurturing, mystical craft. In contrast, modern industrial machine-driven technologies favor problem solving and economic efficiency. Design applied in the modern era has focused on production activities. Design is a series of acts that bit by bit slightly improves the status quo -- purposeful, planned creation. In addition to the modern aspect, I will discuss design as meticulous preparation and focus by the artist with the goal of eliciting a sense of satisfaction and joy in the user -- the fusion of design and planning, creation and craft. Design as hospitality. I would like to consider and envisage lacquer design as hospitaliy, a culture of technology in the field of life. 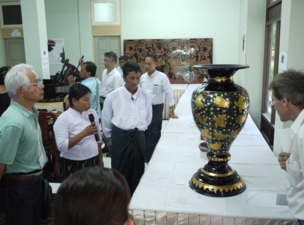 Myanmar Lacquerware technology emerged in the 12th century, the Bagan Era. Incised lacquer techniques were developed in the 17th century, the Nyaung Yan Era. Besides this technique, other commonly used ones are gilding and embossing. In the incised technique, a surface is engraved using the sharp point of a thin metal tool and the incision pigmented. This technique uses red, green, and yellow base pigments. Lacquer techniques were introduced to Japan along with Buddhism from China about 1200 year ago. Kanshitsu, dry lacquer technique, was used to make Buddha statues because of its ability to be shaped into any form, its lightness, and its durability. 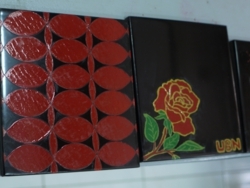 These qualities also made the technique suitable for making lacquerware. Tokyo National University of Fine Arts, established in 1890, encouraged graduates to promote local lacquer crafts for export. 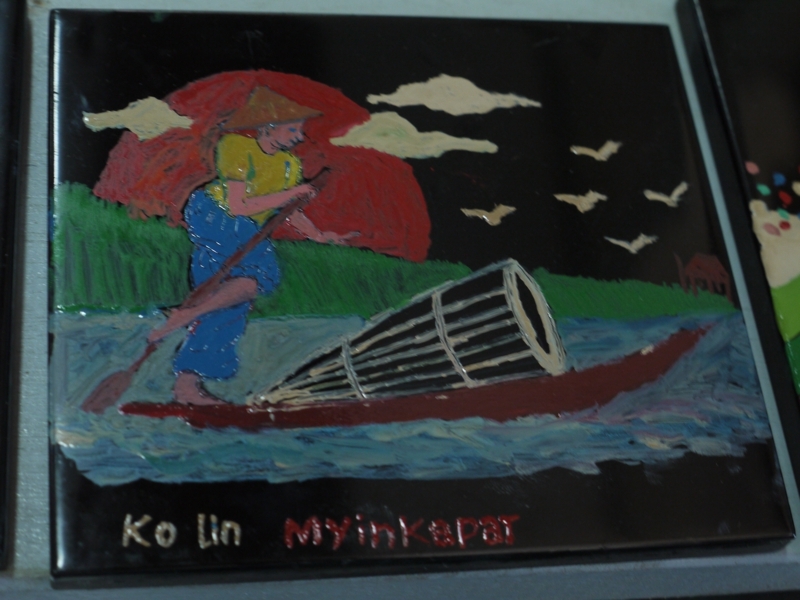 In 1930 lacquerware was displayed at an art exhibition organized by the Ministry of Education and thereby elevated to an art form. In 1955, a law to protect intangible cultural heritage was enacted to safeguard and preserve Japanese traditional culture that was devastated by World War II. 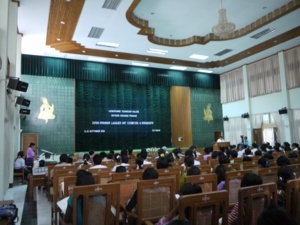 As a result, the appellation, holder of “Important Intangible Cultural Property”, was designated. 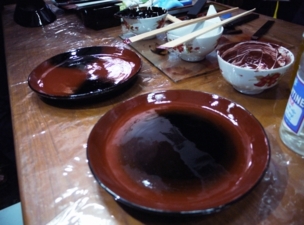 The holders are committed to further the development of lacquer techniques including kanshitsu. Eric Stocker started his training in the crafts of lacquer and gilding techniques in France at age 16 with Maître Pierre Bobot. 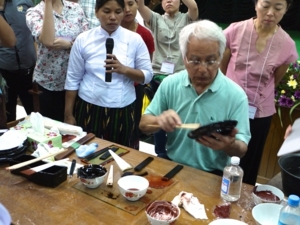 He has since then worked on the restoration of ancient lacquerware from Asia and Europe. 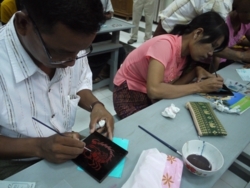 Since the late 1990s, Eric has been working extensively in Southeast Asia, and primarily in Cambodia where his vision is to revive and preserve the lacquer traditions which war and turmoil have almost wiped-out from Khmer Culture. 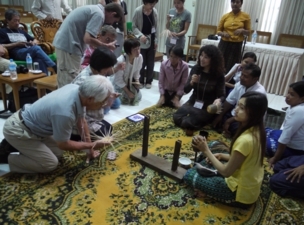 The traditional Myanmar lacquer techniques of "rantai” (bamboo weaving) and "kinma” (scratching and coloring) are also traditional techniques in Kagawa Prefecture. This is a slide presentation of these techniques. Hitoshi Ota, designated a “Living National Heritage” lives in Kagawa, is an expert in the “rantai” technique. 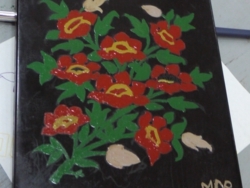 There are a number of well-known artists that use “kinma” technique in their expressive artwork. Horsehair has been used in making lacquerware for about 80 years. It is derived from bamboo weaving. In this technique, bamboo strips are the weft while the horsehairs are the warp. Small items such as cups, cigarette, and betel boxes are made using horsehair. 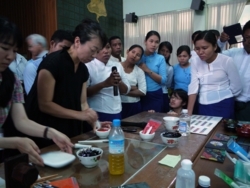 This workshop uses Myanmar lacquer in combination with safe Japanese developed pigments which are nontoxic to the human body. 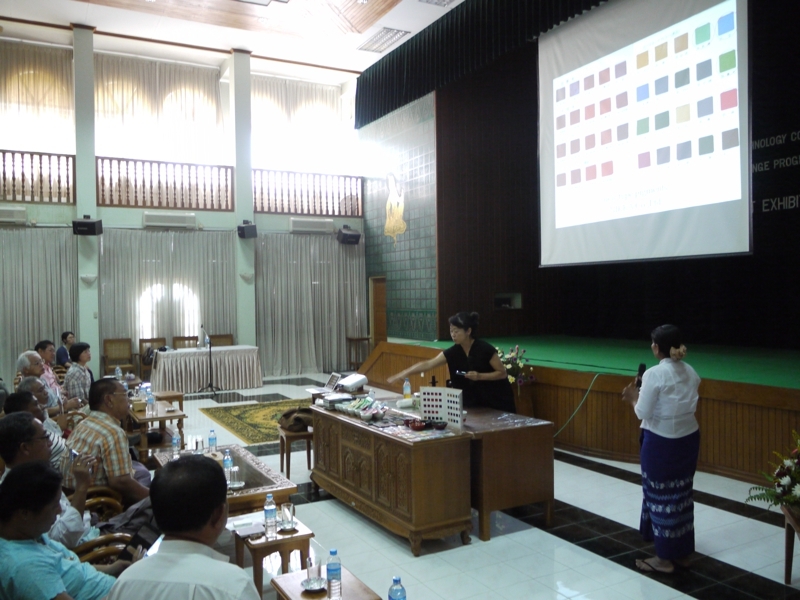 The pigments were developed by Nikka Kasei Co. Ltd. and donated by Mr. Yamamoto Osamu the company representative. The faculty at the Bagan Lacquerware Technology College have experimented with mixing different kinds and amounts of lacquer with Japanese pigments and examined the results. 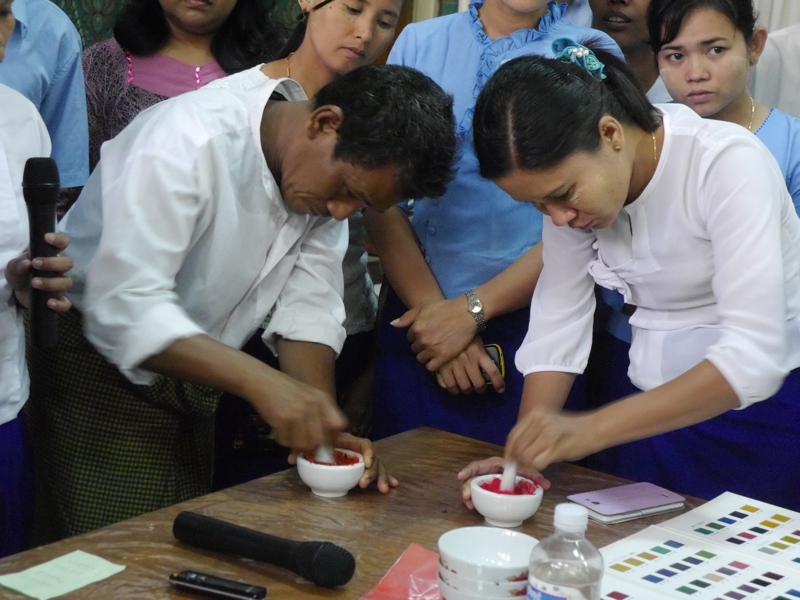 Participants will mix Myanmar lacquer with the Japanese pigments to create a design on a lacquered plate guided by teachers from the College. 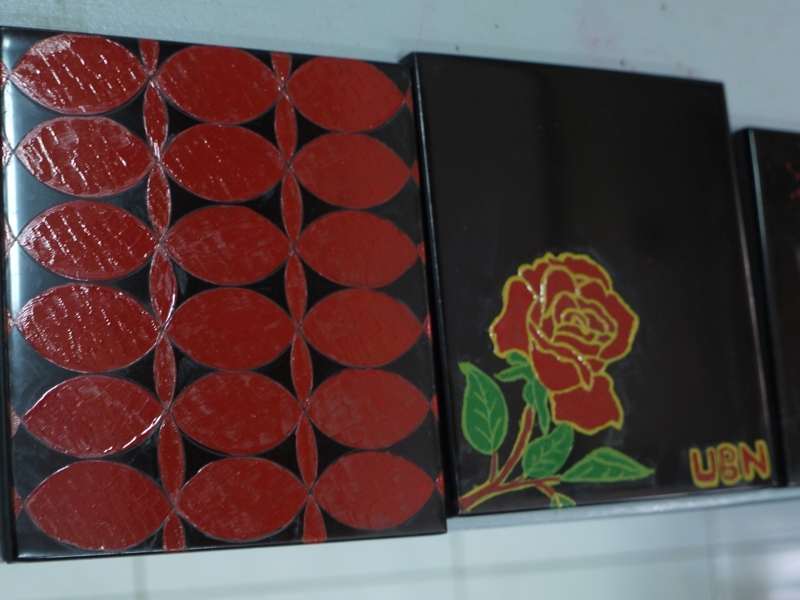 Using the pigmented lacquer participants formulated earlier, designs will be transferred to the lacquer plates, so that the participants can freely express themselves and explore the possibilities of these new, nontoxic pigments. 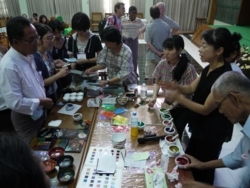 Participants will receive a complimentary sample of Nikka Kasei pigments. 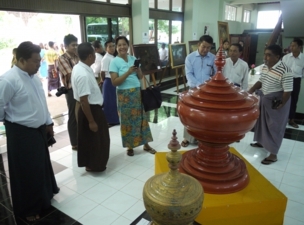 About 40 lacquer art works from Japan, Myanmar and other Asian countries were exhibited.